The CD features the drumming and vocals of King Marong and Mbackeh Darboe. ‘Where I was standing my tears fell.’ To the people of the world, I come to advise you with peace and love, respect human rights. Is a great Mandinka drummer. A traditional song of Mandinka proverb. Where the people of a village sing for Dawda Sanneh to play his drum so they can dance. ‘The Dragon has horns but he will not pierce you. So play your drum so we can dance’. Traditional Mandinka song, advising no need to push and fight for what you want. The universe will provide. 6. Gambia A song welcoming the people to my home Gambia. The smiling coast of West Africa. Where peace and love will greet you. 8. Mali Sarjo Traditional Mandinka song A story from Mali Barfula of a legendary great being who could change his appearance. Whilst in the water he was a great hippopotamus, when on the land he changed into a man. He was very cunning and also able to disperse magical wealth. His love for a beautiful girl whom he bribed with his riches for her love and to keep his secret. Ultimately it turned against him and destroyed him. 9. Djembe Sarav Sound of the Djembe A selection of djembe rhythms combined. Also incorporating a West African women’s dance rhythm. 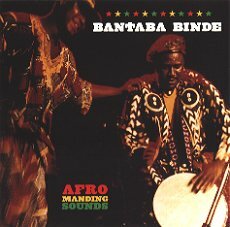 The CD is also available at any of Bantaba Binde’s gigs. Check out Adelaide street press for gig details. Ebrima King Marong inspirational percussionist and Mbakeh Darboe, dancer and singer are of Mandinka culture from Gambia, West Africa. They are highly respected musical ambassadors of their rich cultural tradition. Specialising in the vibrant rhythms, songs and dances of Afro Manding, Wolof and Jola traditions. Mbakeh was born in an up country village Janyari, inheriting his musical style, pulsating dance and songs from his Griot family. Ebrima King was born in Wasulung Kunda, Bakau an active coastal town. He is a natural player and his taste, inspiration and knowledge was guided by Griot Jali Nyama Suso and people of the coastal town. King is an outstanding percussionist, being a master of djembe and sabar ensembles as well as a powerful melodic singer. Together for many years Ebrima King and Mbakeh performed with top Gambian group \’Roots Kunta Kinteh\’, a contemporary Afro Manding cultural band. They regularly appeared on radio, television and performed at national music events. Also a much loved favourite at community celebrations. Ebrima King Marong and Mbakeh Darboe have united in Australia where they continue to create, share and promote Afro Manding cultural sounds forming the hand ‘Bantaba Binde’ (‘the meeting place’ in Mandinka). They have composed a magical, dynamic array of rhythmic songs. Mbakeh’s singing and passionate lyrics combined with Ebrima King’s powerful percussive melodic rhythms form the backbone of this pulsating and vibrant music. Using traditional instruments the djembe, bass drum and doudounba blended with improvised sounds using saxophone, lead guitar and bass guitar. They have created a sound that absolutely captivates the hearts and souls of people.